Have you always been interested in using a stand-up paddle board but uncertain about how to get started? Aqua Marina’s Fusion Stand-up Paddle Board is an excellent option for first-time paddlers and other relative novices. Inflatable paddleboards can seem like a risky choice. Are they really as strong and durable as a non-inflatable paddleboard made from epoxy and other permanent material? While some inflatable paddleboards are cheaply made, you won’t have any such worries with the Aqua Marina Fusion. The Aqua Marina fusion has solid double-wall drop-stitch PVC construction with a wide design and plenty of grip. 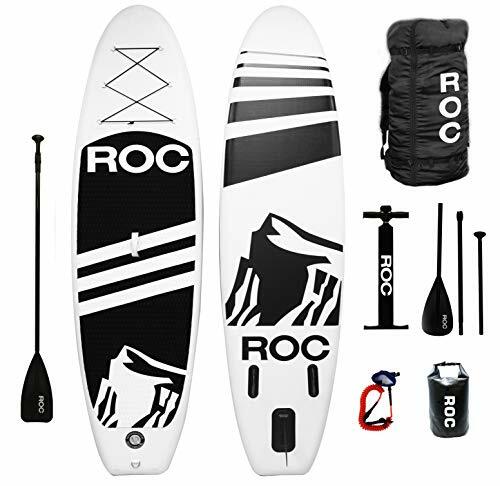 While workable for waves and medium-fast moving water, thisstand up paddle board is designed for cruising and exploring flat water lakes, rivers, bays and more. Transportation and storage for an inflatable paddle board is usually much easier than with a solid board. 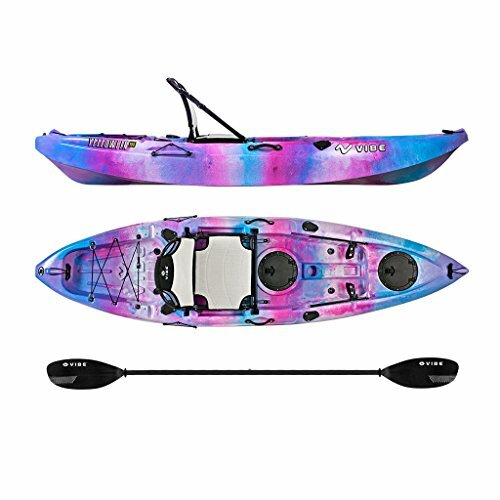 If you’re new to paddle boarding, the Fusion is an easy and durable board which is perfect for learning. Intermediate and advanced users will likely appreciate the overall quality and affordable price. Inflatable stand up paddle boards are different from a pool float or inner tube. SUPs have a much more advanced, durable construction. The Fusion is made from polyester reinforced PVC rail bands. This drop-stitch material is resistant to UV damage, abrasions and tears. Maximum inflation pressure if 15psi, which is stronger enough to hold the shape while remaining comfortable to stand on. The two layers of material are connected by hundreds of internal threads to help improve performance on the water. The nose of the board has four D-rings and a bungee cord storage tie. Aside from docking, you can also use the D-rings to securely store your backpack or other gear. Underneath the board is a large fin. When installed, the fin helps with stability and navigation. If you’re an experienced rider, you can remove the fin for more of a challenge in the water. A high quality inflatable board like the Fusion has many advantages over a solid paddle board. A solid board can be difficult to store and transport. You’ll need to find enough space in your garage or another area of your house to store a board, which can be upwards of 10 feet long. Plus, you’ll also need to transport the paddle board. Non-inflatable boards are generally attached to the roof of a vehicle. While custom racks are available, the process of tying a board to a rooftop can be a hassle. Also, if you don’t attach the board properly, all sorts of mayhem can result on the road. 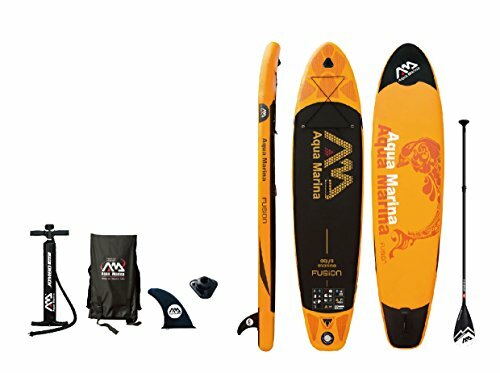 The Aqua Marin Fusion is much easier to transport and store compared to a solid board. Inflating the board is quick and simple with the included HOMBO23.5-inch hand pump. You can also purchase any standard electric pump for even faster inflating, although the hand pump is pretty fast on its own. Once inflated, transportation is easy thanks to a carry handle located in the middle of the board. Although a nose or tail handle would be ideal, the mid-range carry handle usually provides a sure grip even in wet conditions. Storage is a snap with an inflatable stand up board. Deflated, the board easily fits into the included Magic Backpack for easy carry. The Backpack has storage space for the deflated board, the hand pump and all other included accessories. For many people, the biggest hassles related to a stand up paddle board involve movement on land. If you’re concerned about a lack of storage space, or don’t want to deal with placing a board on a roof rack, an inflatable stand up paddle is probably a better option for your needs. Large size – The ideal rider is a medium to heavy sized male. Will also comfortably fit two small to medium sized riders. Comfortable – Surface area cushions feet thanks to the extra thick six-inch padding. Stylish – Bold, dynamic orange color with dolphin illustration on theback. Safe – Large EVA anti-slip foot pad with honeycomb design keeps your feet on the board even in wet conditions. Easy to inflate – Includes HOMBO SUP pump with gauge for quick, foot-powered inflation. Any optional electric-powered pump is even faster. Steady Navigation – The large center fin helps keep your balance steady even in rough waters. Also helps with easy steering. Easy transportation – The deflated paddle board and pump both fit into the included Magic Backpack for effortless carry. Secure Storage – The nose of the board has 4 D-rings to hold packs, water bottles and other outdoor gear. The benefits list for the Aqua Marina Fusion is extensive. But how does the Fusion paddle board handle in the real world? Reviews from actual Fusion owners provide an unvarnished look at the pros and cons of the board. Generally, most users seem very pleased with their Fusion purchase. They tend to consider the board to be a good value. One user compared his Fusion to a friend’s much higher priced board. While the top-of-the-line board had some slight advantages, the significantly less expensive Fusion was definitelyvery similar in overall quality. Many of the users remarked that they were completely new to paddle boarding. One person said he’d never been on a paddle board before in his life but had the board assembled and was on the water “within eight minutes.” After another five minutes, he was standing on the board and paddling comfortably. Of course, not every review will be positive. The most common complaint seems to be misaligned fins. Basically, the fin isn’t glued on perfectly straight. This can lead to an issue where the rider needs to paddle more on one side than the other just to go in a straight line. Fortunately, this isn’t a huge issue because Aqua Marina’s customer service is generally considered top-notch. Manufacturing defects will likely be covered by the company’s 12-month warranty. This gives you plenty of time to use the board in a variety of conditions. Speaking of paddles, this board does not include a paddle. You’ll need to purchase your own paddle separately. Fortunately, this isn’t a huge issue. The cost of theboard is low enough that buying the Fusion and a separate paddle is comparable to buying a similar board with an included paddle. The Aqua Marina Fusion is a cost-effective way for anyone to enjoy paddle boarding. The drop stitch PVC construction is tough and damage resistant. But the strength isn’t at the expense of comfort. With thick padding and an EVA honeycomb foot, the Fusion is comfortable to stand on for extended periods of time. Inflated, the board is 10 feet long and thirty inches wide. This provides a comfortable standing surface best suited for either an adult male or two smaller individuals. Alternately, there’s enough room for an adult and a young child — or even an adult and a dog. Transportation is easy. Instead of strapping the board to your car, you simple deflate it. The board includes a 23.5″ extra high aspect pressure hand pump. The deflated board and all included accessories easily fit into Aqua Marina’s Magic Backpack. The Aqua Marina fusion is affordable, durable and easy to learn on. Both novice and veteran paddle boarders will find a lot of benefits with this board. Perfect for family fun on the local lakes, rivers and more.